We’d love your help. Let us know what’s wrong with this preview of Dragons of Eden by Carl Sagan. Dr Carl Sagan takes us on a great reading adventure, offering his vivid and startling insights into the brains of humans & beasts, the origin of human intelligence, the function of our most haunting legends and their amazing links to recent discoveries. To ask other readers questions about Dragons of Eden, please sign up. Is this worth reading in 2014? لو غاوى كتب الأرصفه و الأعلى مبيعا سيعجبك ككتاب خفيف و ممتع و اسلوبه شيق لكن لو بتقرأه من أجل الماده العلميه هتلاقيه سطحى و غير دقيق و يستند لأطروحات و استنتاجات نظرية لم يدعمها العلم بصوره قاطعه و لا حتى بصورة شبه مؤكدة. العنوان خادع شويتين و لو انه متوقع ان كتاب بالحجم الصغير ده صعب يناقش قضية بالخطورة دى لكنه مسلى و تقدر تعتبره مقدمة فى فهم المخ البشرى و تطوره لدى الانسان. لديه فقط خبرة في البيولوجيا. بدأ الفصل الأول "كتنانين عدن"
"كما أرجو القارئ أن يسامحني على حذف سطور قليلة من الكتاب رأيت أنها ستجعله أكثر صعوبة وأنها لن تضيف شيئاً إلى الموضوع, علاوة على تجاوزها أحيانا لبعض الخطوط الحمراء في ثقافتنا." أما عن حذفه للعبارات التي رآها تتجاوز الخطوط الحمراء فهو أمر عجيب. "فكل ما شاهدوه في هذا المجال استعارات مشوهة من بعض هذه البرامج العلمية ,تلغي ما عليها من تعليقات ذكية مثيرة للتساؤل البنّاء وتوضع بدلاً منها تعليقات سطحية خفيفة تحتوي على كثير من الأخطاء , وتصب دلواً من الثلج البارد على كل ما كان يمكن أن تثيره هذه البرامج من نشاط عقلي"
وأظن أنه يلمح إلى برنامج العلم والإيمان الذي كان يقدمه دكتور "مصطفى محمود", وهنا يحق لي التساؤل, إذا كان يريد لنا التعرض للأسئلة البناءة, وبناء عقل نقدي, فلماذا حذف تلك المواد التي يراها لا تناسب مجتمعنا؟ أليس هذا الحذف يرد إلى أنه لا يريد صدمنا بأي أسئلة قد تشككنا في عقائدنا أو قومياتنا, فقام هو بدور الوصي علينا وحذفها. كيف لنا إذاً أن ننمي عقلاً نقدياً ونحن لا يترجم لنا ما قد ينقد أصلاً, فكل ما يصلنا الآن هو ما يصلنا دائماً, نفس الأفكار التي تحيط بنا ونتبناها دائماً. وعلى هذا فإني أراه مدعي حرية, حتى وإن فعل ما فعله كقرباناً من أحد الأقلية تغزلاً في الأغلبية المتسلطة. المهم يعني, ابقوا على حذر من الترجمات المصرية, وعليكم بالترجمات اللبنانية والعراقية, وبعض الثقات من دور النشر. Chimpanzees can abstract. Like other mammals, they are capable of strong emotions.Why, exactly, all over the civilized world, in virtually every major city, are apes in prison? For a species that has proclaimed itself to be the rulers of Earth, this is not a very difficult question to answer for us. It is a single word : suppression. We humans never much liked competition from other creatures and history tells us that this was how we overcame all our natural predators through weaponry or guile in the eons past. A moment of reflection on our past brings up that question : why did the other humanoids not survive while our ancestors did ? How did they all gt wiped out ? Natural selection could not have been the only answer.This book is one that shook me out of cerebral complacency and like a good author, Sagan opens the cobweb laden windows of my brain and lets the light in. This is a book length introspection into the nature of human intellect. From the first tottering steps of our primate ancestors to today's technologically addicted life forms, how has the journey been for that mass of tissue between our ears ? This is what Sagan attempts to answer. In simple,lucid and easy to comprehend prose the author breaks down the story of how our brains assumed today's form and reflexes. It is a tour de force that mixes and matches history,paleontology, psychology and other branches of human understanding to come up with a fascinating study. The evolution of the brain and how the most primal fears in our psyche still rule our subconscious is a fascinating observation and forms the best part of this book. The aspect of the Triune brain and the R-complex's involvement in human behavior is what Sagan calls the Dragons chained away in the dungeons of our minds. Our basic aversion to reptiles and the dreams populated with snakes coupled with the dreams of a fall from a height are all speculated upon by Sagan in teh backdrop of our dreams. They were quire revelatory and while I might at a later point in time (with more reading)debate these points, they did rekindle my interest in the human brain's inner workings. I finished reading, put down the book and ran my fingers through my hair and muttered You are a rockstar to my brain. The kind of rockstar who you can never fully figure out is how it might react to that comment ! 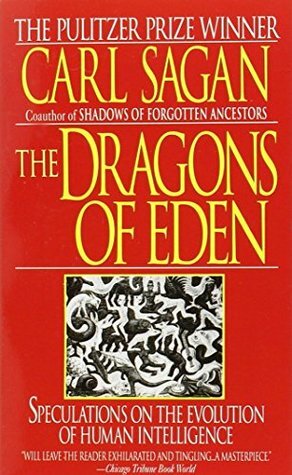 The Dragons of Eden: Speculations on the Evolution of Human Intelligence is a 1977 book by Carl Sagan, in which the author combines the fields of anthropology, evolutionary biology, psychology, and computer science to give a perspective on how human intelligence may have evolved. In this case, it's consciousness. By the title, he's referring to the lizard brain. And considering the fact that he was writing this out of the 70's and he disclaimed the hell out of it, it's meant to be a conversation starter for laymen. And it's good, too. If I was reading this 40 years ago or even 30 years ago, I'd nod energetically at a lot of the ideas. The writing is good, the ideas sound, and the subject is still obviously open today. So what did I have a problem with? Actually, my complaint is rather prosaic. It's just dated. HEAVILY dated. It's like the line from Hitchhiker's Guide to the Galaxy where Prosser still thinks that digital watches are a good idea. There are better books that do the job of this one, but for the time I'm sure it was pretty fantastic. Not everything was dated. Philosophy and basic math and the broad strokes were good. But the fields of mental health, computers and computer games, the current development of cloning, AIs, and a huge extra list WAS. "Chimpanzees can abstract. Like other mammals, they are capable of strong emotions. Why, exactly, all over the civilized world, in virtually every major city, are apes in prison?" "Humans have systematically exterminated those other primates who displayed signs of intelligence." Carl Sagan is the best science teacher one can ever get. Even though I am not a biology major, I was able to enjoy this book. A great book where he talks about EVERYTHING that you ever wanted to know about your brain. Proba "Chimpanzees can abstract. Like other mammals, they are capable of strong emotions. Carl Sagan is the best science teacher one can ever get. Even though I am not a biology major, I was able to enjoy this book. A great book where he talks about EVERYTHING that you ever wanted to know about your brain. Probably one of the best non-fictions I have ever read. In this Pulitzer prize winning book, Carl Sagan, indubitably one of the finest scientific minds of our time, expresses his thoughts about life, most particularly about intelligent life, and its relation with the environment that gave it origin and shaped it. Aided by anthropological notions, evolutionary biology, psychology, and computer science, Sagan gives a well balanced perspective of how human intelligence evolved. However, notwithstanding Sagan's expertise in astrophysics, he warns us that In this Pulitzer prize winning book, Carl Sagan, indubitably one of the finest scientific minds of our time, expresses his thoughts about life, most particularly about intelligent life, and its relation with the environment that gave it origin and shaped it. Aided by anthropological notions, evolutionary biology, psychology, and computer science, Sagan gives a well balanced perspective of how human intelligence evolved. However, notwithstanding Sagan's expertise in astrophysics, he warns us that in the neurosciences he's more of an amateur scholar than consumed expert. That, added to the age of the book, results in much of the book being speculative work. Interestingly, some of his assumptions have been latter integrated to the commonly accepted model for the evolution of the human brain. One of my favorite sections of the book takes on the biological function behind human intelligence. I particularly like when Sagan considers the complexity of biological life forms, putting in perspective the real significance of our cultural and technological advances. Anyone interested in human evolution will find this book exciting. The meaning of the evolution of extra-genetic intelligence (brains in animals and humans) and extra-somatic intelligence (writing, books, computers) in humans, the nature of instincts buried in our older "reptilian brain" regions, the conflict between the left and right neocortex and the purpose of each, this is exciting stuff that we can all see at work in our lives, giving evolution an extra layer of reality. After finishing reading, I was left wondering if the next evolutionary step would imply a complete detachment of our mind from the primate emotional instincts, and reliance only on the rational, more advanced brain. Is our brain on its way to become alike to Artificial Intelligence? I think Sagan did an extraordinary job with this book. His writing is engaging and easy to understand, even if you're not too much into the sciency stuff. Most impressive is how diverse, interesting and mind opening are the many well-informed topics contained in the ca. 250 pages of this book. Bugün öğlen saatlerinde büyük bir heyecanla elime aldığım kitabı an itibariyle üzülerek bitirmiş bulunuyorum. Cosmos kitabıyla tanıştığım Sagan'ın biraz daha farklı konulara değindiği bu kitabını da Cosmos ile aynı keyif ve heyecanla okudum. Sagan'ın ne kadar büyük bir deha olduğunu bir defa daha gördüm. Zira, alanı dışında bir konuda yazıyor ve bunda da son derece başarılı olduğunu düşünüyorum. Her ne kadar, bilimin doğal akışı gereği kitaptaki bazı bölümlerde sonradan yeni kanıtlar, gelişmeler Bugün öğlen saatlerinde büyük bir heyecanla elime aldığım kitabı an itibariyle üzülerek bitirmiş bulunuyorum. 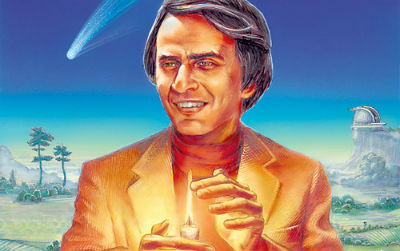 Cosmos kitabıyla tanıştığım Sagan'ın biraz daha farklı konulara değindiği bu kitabını da Cosmos ile aynı keyif ve heyecanla okudum. Sagan'ın ne kadar büyük bir deha olduğunu bir defa daha gördüm. Zira, alanı dışında bir konuda yazıyor ve bunda da son derece başarılı olduğunu düşünüyorum. Her ne kadar, bilimin doğal akışı gereği kitaptaki bazı bölümlerde sonradan yeni kanıtlar, gelişmeler ortaya çıktıysa da (Aklıma gelenler; Nenderthallerle ilgili gelişmeler, Dinazorların nasıl yok oldukları bölüm, fizik kurallarının evrende her noktada aynı işlediğini söylediği son bölüm ve bilgisayarların en fazla tuşlarının basılabilirliği ölçüsünde küçüleceğini söylediği bölümde dokunmatiği veya giriş ünitesi olmayan mini bilgisayarları öngör-e-memesi) son derece normal kabul edilebilir ve edilmelidir zira bilim insanının kahin olması beklenemez. Belki elli yıl sonra bu kitaptaki bilgilerin tamamı altüst edilecektir. Kitapta toplumsal değerlere, dine, siyasi teamüllere vs. pek eleştiri yapılmamış. Zira bugün bilimde deneylerin insanlar üzerinde yapılması konuları dahil olmak üzere hala tartışılan bazı ilkeler ya da etik değerler var. Bunlardan bahsetmemiş olması akıllıca. Sagan, okur kaybetmek istememiş. Bunun yerine, daha çok insana daha çok bilim ulaştırmak istemiş. Kitaptaki Shakespeare, William Blake vs. alıntıları Sagan'ın aynı zamanda ne denli büyük bir okur olduğunu da gösteriyor. Müspet bilim ile sınırlı tutmamış okumasını, neredeyse her konuda bir şeyler öğrenmeye çalışmış. Kitapta özellikle insan beyni hakkında çok şey öğrendim. Beni en çok etkileyen ise "Tekrarlama Teorisi" idi. Evrimsel sürecin aşamalarının embriyoda kendini gösterdiği, beynimizin ise ilkel beyinlerin üzerine eklenerek geliştiği yönündeki fikirler benim ufkumu genişletti. Keşke onu tanımış, onun öğrencisi olsaymışım. Oysa okumak, onun dersini almak gibi kabul edilebilir mi? Interesting read, as long as one takes into account that it's quite old and outdated by now, so it's not exactly cutting edge. (I read it pretty long ago myself). Still, Sagan has a such a pleasant, conversational style, that even reading it for the speculations alone, makes reading the book a not unpleasant way of whiling away your time. I like the angles he chooses to speculate from, especially the bits about instinct and how myths most probably formed in the human collective subconscious. Interesting questions on the origin and development of human intelligence. Still worth a read despite lots of progress since he wrote this. Gives a good description of left/right brain competencies. Has piqued my interest in evolutionary development. The guy was taken from us too early but sure made a name for himself in what time he had. ¡He leído mi primer libro de Sagan! No saben cuánto tiempo llevaba esperando esto. Tantas recomendaciones, tanto cariño de tanta gente por este gran hombre... siento que lo quiero por la semilla que ha dejado en tantas personas, tuvo que ser un gran hombre para marcar tanto a toda una generación. Es increíble que yo lo admirara tanto sin conocer su trabajo, solo por ver cómo la gente hablaba de él. Y por fin... me atreví, mi primer libro de Sagan. Vamos con él. No, no es un libro sobre astronomía ¡He leído mi primer libro de Sagan! No saben cuánto tiempo llevaba esperando esto. Tantas recomendaciones, tanto cariño de tanta gente por este gran hombre... siento que lo quiero por la semilla que ha dejado en tantas personas, tuvo que ser un gran hombre para marcar tanto a toda una generación. Es increíble que yo lo admirara tanto sin conocer su trabajo, solo por ver cómo la gente hablaba de él. Y por fin... me atreví, mi primer libro de Sagan. Vamos con él. No, no es un libro sobre astronomía, ni astrofísica... es un libro sobre biología, la biología del ser humano, en particular su inteligencia. Y es un libro obviamente marcado por lo que se sabía en su época, muy lejos de lo que hoy se conoce, sobre el ser humano y su cerebro. Un libro, en muchos aspectos desfasado. Y esto para un físico leyendo biología es una bomba. ¿Qué de lo que leo sigue vigente y qué ha pasado a la historia? No lo sé... Eso sí, lo que nunca va a pasar de moda es ese calor único que desprende Sagan, como persona. Cuando habla de la ciencia, como habla de ella, se nota tanto que lo que siente por ella es tan puro y tan contagioso. Es esencia de Sagan, yo lo sé, es su sello, lo que siente y transmite es único. GRACIAS SAGAN. Depois do Big Bang, o Universo criou-se e, no meio dele (ou não fosse uma das nossas características, a queda irreflectida para o antropocentrismo), a vida tomou forma para criar diferentes espécies, até ao seu refinamento major, designado como "Homo sapiens". De facto, o processo intrincado da evolução das espécies despertou, desde cedo, a curiosidade do Homem, com Charles Darwin a dar um grande empurrão nesta pedra de Sísifo. Sem abandonar o seu querido calendário cósmico, do qual apenas vislu Depois do Big Bang, o Universo criou-se e, no meio dele (ou não fosse uma das nossas características, a queda irreflectida para o antropocentrismo), a vida tomou forma para criar diferentes espécies, até ao seu refinamento major, designado como "Homo sapiens". De facto, o processo intrincado da evolução das espécies despertou, desde cedo, a curiosidade do Homem, com Charles Darwin a dar um grande empurrão nesta pedra de Sísifo. Sem abandonar o seu querido calendário cósmico, do qual apenas vislumbramos os últimos momentos do último dia do ano, Carlos Sagan pretende dar uma nova roupagem a esta eterna questão. Com uma linguagem adaptada ao comum dos mortais, Sagan passa em revista alguns factos interessantes que marcam a nossa essência. A desmesurada quantidade de informação armazenada na memória, que supera aquela contida no ADN (já contando com o chamado lixo genético), é realmente necessária para abarcar tais curiosidades. E a reacção a esta obra requer a interacção orquestrada entre as diferentes partes do cérebro (das intervenientes nas necessidades básicas às responsáveis pelas abstracções, passando pelas que dominam as emoções) e, mais especificamente, as 4 divisões do córtex cerebral, repartidas pelos 2 hemisférios - o esquerdo mais analítico e o direito mais intuitivo, tão diferentes mas tão relacionados (não apenas por essa via rápida chamada corpo caloso) pois um sem o outro estão condenados ao fracasso. Destaca-se o aguçado sentido de humor utilizado em várias passagens. O gozo pelo facto de um psiquiatra ter como sobrenome Dement, o estudo probabilístico sobre a oportunidade de engravidar, a explicação da abjecção natural à cor vermelha e a sua utilização quotidiana, a ironia ao comparar o aborto a um simples corte da pele (explicado em termos biotecnológicos) e menosprezo pela esquerda pelo facto de essa ser a mão do asseio. Para além disso, interpreta-se a Bíblia, à luz da ciência, com abordagens interessantes: a perda de comunicação com os animais aquando da oferenda da serpente do pecado e a mistura de línguas imposta em Babel para impedir a comunicação entre os habitantes da torre de Babel e, consequentemente, dificultar o atingir dos céus. Como pontos negativos, aponta-se apenas a fraca tradução com uso de português do Brasil, mesclados com erros e termos arcaicos já em desuso (desculpável, tendo em conta a antiguidade desta edição). This was an interesting book to read after all of the recent research and groundbreaking discoveries of the human brain. Clearly, Sagan smokes weed. However, there are times when he must be coming off his high that his insights are both subtle and poignant. Oxymoronic, to be sure, but so was most of Sagan's keen skepticism amidst his psuedoscientific platitudes. That being said, some of the best parts of this book are the drawings related to studies conducted on patients with a s This was an interesting book to read after all of the recent research and groundbreaking discoveries of the human brain. Clearly, Sagan smokes weed. However, there are times when he must be coming off his high that his insights are both subtle and poignant. Oxymoronic, to be sure, but so was most of Sagan's keen skepticism amidst his psuedoscientific platitudes. Carl Sagan, like Stephen Jay Gould, is one of those scientists gifted as a teacher to non-specialists. This book is about intelligence, a topic both men dealt with, Gould most notably in his Mismeasure of Man. Sagan, however, deals with all intelligence, ending his book with a discussion of nonhuman intelligences, most particularly certain Cetaceans and primates. Noting that chimpanzees and gorillas appear to be intellectually comparable to human five-year-olds, he ends with a plea to extend som Carl Sagan, like Stephen Jay Gould, is one of those scientists gifted as a teacher to non-specialists. This book is about intelligence, a topic both men dealt with, Gould most notably in his Mismeasure of Man. Sagan, however, deals with all intelligence, ending his book with a discussion of nonhuman intelligences, most particularly certain Cetaceans and primates. Noting that chimpanzees and gorillas appear to be intellectually comparable to human five-year-olds, he ends with a plea to extend some of the rights we afford our own children to members of other intelligent species. I read this one quite long back... and really loved it at that time. I only remember two things from the book, however. The first one is where Sagan speculates that God's curse on Eve, "you shall bring forth your children in pain", refers to the increased cranial size of intelligent homo sapiens. It is common knowledge that childbirth in humans is much more painful than in animals because of the larger size of the head due to an enlarged brain: thus, could the story of Eden contain a veiled refer I read this one quite long back... and really loved it at that time. I only remember two things from the book, however. The first one is where Sagan speculates that God's curse on Eve, "you shall bring forth your children in pain", refers to the increased cranial size of intelligent homo sapiens. It is common knowledge that childbirth in humans is much more painful than in animals because of the larger size of the head due to an enlarged brain: thus, could the story of Eden contain a veiled reference to evolution? I feel strongly that this book should be included in mythology courses because better than any textbook I've ever encountered it addresses the connections that exist between mythology and science. Not to say that mythology is scientific, but rather the ways of viewing the world, both contemporary and historical, that human beings seem to return to again and again often are the way they are for very sound biological reasons. Knjiga je jednostavno nevjerojatna. uz minimalno, ali stvarno minimalno poznavanje anatomije i fiziologije mozga-na razini osnovnoškolske biologije- čitatelj može pratiti razvoj građe i funkcije ljudskog mozga, uz savršeno smisleno i logično objašnjenje naših strahova, ponašanja, snova, uspjeha i neuspjeha. preporučeno svima. Recommends it for: Everyone. Science lovers. Pure bliss. In the inimitable manner of Carl Sagan, engrossing, enlightening and amusing in equal measure. التى يراها هو تعديا للخطوط الحمراء!! وقيم المجتمع!! След мечтата за Вселената, събрана в “Бледа синя точица”, дочакахме със скромните четирийсетина години закъснение и още една от книгите на великия Карл Сейгън – “Дракони в Райската градина”. От погледа към Космоса той ни насочва към поглед навътре – към нас, към мозъците ни, към еволюирането ни като вид, който осъзнава себе си и може да променя света, както и да търси разум не само в другите видове, живеещи с нас на планетата, но и сред звездите. كتاب علمي رائع وممتع ومسل بكل صفحة من صفحاته.. معلومات قيمة عن الإنسان وعن العقل البشري، ادهشني الكاتب بهذا الكم الهائل من المعلومات من جهة وجهة اخرى بسلاسة طرح هذه المعلومات! Carl Sagan was a planetary scientist with primary interest in exobiology and extraterrestrial intelligence. He was perfectly aware that speculation, study and understanding of extra-terrestrial intelligence would require a thoroughly comprehensible understanding of terrestrial human and non-human intelligence such as primates and aquatic mammals. If emergence of intelligence is convergent end point of many different evolutionary histories, as evident in our expectations of intelligent aliens, th Carl Sagan was a planetary scientist with primary interest in exobiology and extraterrestrial intelligence. He was perfectly aware that speculation, study and understanding of extra-terrestrial intelligence would require a thoroughly comprehensible understanding of terrestrial human and non-human intelligence such as primates and aquatic mammals. If emergence of intelligence is convergent end point of many different evolutionary histories, as evident in our expectations of intelligent aliens, then some universal aspects of intelligence will transcend the evolutionary and biochemical differences. In other words, some features and characteristics of intelligence would be similar in intelligence emerging throughout the Universe. He knew this and he spent considerable time in studying evolution of intelligence on Earth. This book is an outcome of his research, intended to present his insights, speculations and related findings for a reader with enthusiasm in Science, and for the young readers who wish to pursue Science it can work as a book stimulating their interest and teaching them to draw insights. Carl states the premise of the book to be ancient myths which turn out to be remarkably in coherence with modern scientific findings. 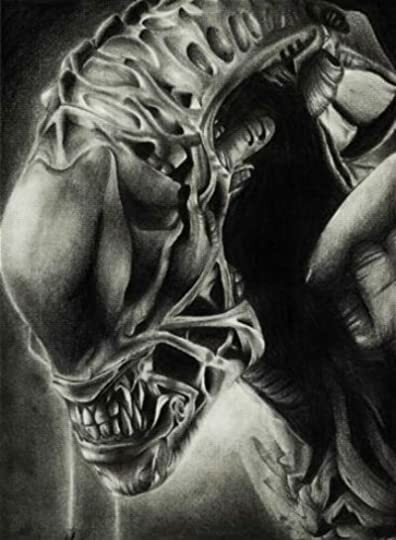 One of the examples he states is the constant mythological depiction of arch-rivalry of dragon and the man. Now this myth is found to be consistent with findings regarding the fierce competition between Reptiles and Mammals in the early emergence and evolution period of the Mammals, which the Mammals won because of their smarter brains, co-operation and protection of the young; behaviors significantly in contrast with those of the Reptiles. Another is the constant conflict of motives and interest between aggressive R-complex, part of the human brain inherited from our reptilian ancestors, and rational Neo-cortex which is unique to primates. It must be noted that vague correlation of ancient myths with current scientific findings doesn't imply that ancient myths contain any iota of rationally obtained scientific truth in them, but rather the fact that myths are just representations of our vague intuitions and casual observations of our surroundings. This intuition could have been supported by the observation that infants of human and non-human primates are born with an inherent fear of snakes, and this fear could plausibly be related to perennial rivalry and hostility between reptiles and mammals, and consequently giving rise to the aforementioned myth. The book begins with a rudimentary introduction of evolutionary theory, mutation, accretion and propagation of favorable mutations, information content of the DNA and how it manifests itself in living beings and their apparent complexity; eventually arriving on the evolution of brain. He explains the various parts of brains in different taxonomic divisions, their functions and redundancy in the terms of pisces brain, R-complex(reptilian brain), limbic system(mammalian brain), neo-cortex in humans and other primates. He explains the origins of our aggressive, ritualistic, hierarchy and sexual attitudes by attributing them to R-complex and cynically remarks upon his observation that our political and social conditions are predominantly controlled by our reptilian instincts. Then he elaborates upon the origin of our emotions such as love and fear in the limbic system, which is also associated with recognition of smell and keeping of our short-term memories. With examples of different experiments by neurobiologists, he shows the effect of electrical stimulation of different parts of brain to determine their functions and how electrical stimulation gives output that is consistent with the phenomena of perceiving from external stimuli. A remarkable conclusion derived from his intuitions in this book, after comparing working principles of artificial intelligence and biological intelligence, is that free-will can be completely disregarded; and if someone denies consciousness to a fairly intelligence machine on the grounds of "just being a metallic machine", then we should disregard the intelligence of machines made of Carbon as well. Next, he embarks on the intelligence of non-human primates, their lifestyles, their symbolic languages and scientific experiments performed on them which show them to be as much intelligent as our ancestors, the Homo Habilis. Then he raises questions about imprisoning and maltreatment of the apes by us, whose level of rationalism and consciousness is shown to be comparable with microencephalic humans and aquatic mammals such as dolphins and whales. He demands compassionate and ethical treatment of our fellow sentient beings, so that we can undo the harm caused by our ancestors who had wiped out all the species from the face of Earth which showed even slight upsurge towards intelligence. Neanderthals, Cro-Magnons, Homo Erectus, Australopithecine robustus and many other species contemporary to our ancestors were brutally massacred by our ancestors in their quest for survival. We can compensate for that harm by ethically treating our fellow sentient primates and helping them develop intelligence, efforts to teach symbolic languages to Chimpanzees can be considered as the first step towards that. We can also cherish in the fact that common communicative language contains about 1000 words and many lab Chimpanzees easily learn around 200 words, they seem capable of abstract reasoning, sense of humor, asking questions, creating new phrases and forming expletives as well. There is a brief account on our interpretation of dreams in a manner consistent with neurobiology, after a brief but lucid interlude on explaining the evolutionary origins of dreams and sleep. The logical incoherence, strong emotional content and fantastic element of our dreams are associated with, respectively, turning off the rational left brain, free reign to limbic and reptilian complex and free association induced in intuitive right brain. It is observed that, during sleep, our left brain indulges in memory buffering and stacking of information which disconnects it from our conscious brain and then right brain shows us patterns without any coherence or correlation while our limbic system and reptilian complex give rise to strong emotional and fear content of our dreams. This phenomena is also explained with help of metaphors and myths which can be considered as aid to our intuitive understanding of these ideas. Then we arrive at vivid descriptions of right brain, left brain and their connecting link: corpus callosum. Corpus callosum works as link to connect our intuitions with our reasoning and is pivotal to almost every advancement in the fields of Science, Art, Humanities and Literature. Our civilization could be said to be a product of corpus callosum. "To write a book in a subject so far from one's primary training is at best incautious. But...the temptation was irresistible." That quote, found in the acknowledgements, sums up both the problems with this work, and also it's ironic charm. You must read this early work of Sagan not as definitive science, but as a prime example of his inimitable ability to connect science to other intellectual concerns such as myth, religion and history, thus stimulating thought in the process. At least Sagan is completely honest: the subtitle itself indicates these are "speculations" which presumably have not been verified. In fact, the book represents a kind of popular science (really, science itself) not seen much anymore. It takes confidence and a willingness to take criticism and the harsh judgement of history, to produce such a work. It's value is of the highest order: that of creative thinking. The writing is the usual poetic Sagan style, highly readable and yet capable of conveying deep thoughts. The difficulties, however, are serious. It's hard to know what is speculation, what was accepted as fact in 1977, what has been proved true, and what's been superseded. Read the book to marvel at Sagan's mind, not to learn current knowledge on how the brain works. I could list many factual things wrong: excessive reliance on the triunal brain (putting too much emphasis on the brains's "reptilian-complex" as a driver of aggressive behavior and everything else anti-intellectual, for example), offering up the wrong theory for the extinction of the dinosaurs (he says it was a supernova explosion: hard to believe that Sagan, himself a planetary scientist, had not even considered in 1977 the now generally accepted asteroid impact theory! ), and I could go on at length. But...there really is no reason to point out the errors. Again, the purpose of this book is not to serve as a textbook, but to stimulate thought—to speculate. "The pervasiveness of dragon myths in the folk legends of many cultures is probably no accident. ... Is it possible that dragons posed a problem for our protohuman ancestors of a few million years ago, and that the terror they evoked and the deaths they caused helped bring about the evolution of human intelligence? Or does the metaphor of the serpent refer to the use of the aggressive and ritualistic reptilian component of our brain in the further evolution of the neocortex? With one exception, the Genesis account of the temptation by a reptile in Eden is the only instance in the Bible of humans understanding the language of animals. When we feared the dragons, were we fearing a part of ourselves? One way or another, there were dragons in Eden." Only Sagan could get away with this poetic image and remain scientific: from almost any other it would be pseudo-science; here it is rational speculation, although certainly offered without any proof. Less seriously, it's fun to read Sagan's view on computers—as of 1977. In almost every book he wrote, he couldn't resist gushing about them! It's possible to string these parts together from his thirty-year-long book publishing career and have a respectable history of computers and their affect on culture and scientific research. Dragons of Eden is a humorous gem in this regard, as, for example: "The computer terminal is a commonplace on the Dartmouth campus. A very high proportion of Dartmouth undergraduates learn not only to use such programs but also to write their own." I remember very well the vast rooms full of terminals which all the students used, it felt almost like prison at times! "Computer graphics are now being extended into the area of play. There is a popular game, sometimes called Pong, which simulates on a television screen a perfectly elastic ball bouncing between two surfaces. Each player is given a dial that permits him to intercept the ball with a movable "racket." Points are scored if the motion of the ball is not intercepted by the racket. The game is very interesting. There is a clear learning experience involved which depends exclusively on Newton's second law for linear motion. As a result of Pong, the player can gain a deep intuitive understanding of the simplest Newtonian physics…"
"There is a popular game, sometimes called Pong, which simulates on a television screen a perfectly elastic ball bouncing between two surfaces. Each player is given a dial that permits him to intercept the ball with a movable "racket". Points are scored if the motion of the ball is not intercepted by the racket. The game is very interesting. There is a clear learning experience involved which depends exclusively on Newton's second law for linear motion. As a result of Pong, the player can gain a "There is a popular game, sometimes called Pong, which simulates on a television screen a perfectly elastic ball bouncing between two surfaces. Each player is given a dial that permits him to intercept the ball with a movable "racket". Points are scored if the motion of the ball is not intercepted by the racket. The game is very interesting. There is a clear learning experience involved which depends exclusively on Newton's second law for linear motion. As a result of Pong, the player can gain a deep intuitive understanding of the simplest Newtonian physics - a better understanding even than that provided by billiards, where the collisions are far from perfectly elastic and where the spinning of the pool balls interposes more complicated physics. Carl takes you on a journey from the mountains to the oceans, from dinosaurs to extra terrestrial beings to explain evolutionary changes and the workings of our mind. While explaining these concepts in a simple, easily understandable language, he lays out the arguments and lets you figure out for yourself intriguing ideas such as how much sleep is enough; why some people can do with less sleep? ; why we think the way we do; why do we have our appendages evolved in the way they are; are we continu Carl takes you on a journey from the mountains to the oceans, from dinosaurs to extra terrestrial beings to explain evolutionary changes and the workings of our mind. While explaining these concepts in a simple, easily understandable language, he lays out the arguments and lets you figure out for yourself intriguing ideas such as how much sleep is enough; why some people can do with less sleep? ; why we think the way we do; why do we have our appendages evolved in the way they are; are we continuing to evolve? ; is it ok to kill apes who are in all probability as human as any of us and the one I enjoyed the most - when is it ok to take life in terms of abortion, mercy killing as well as mammals and animals. Any book on the brain written in the 70s is going to be outdated. For example, Sagan wasn't sure if different parts of the brain affected different things. But an enjoyable read. He does make one important point clear early on: the "mind" is just a function of the brain. Dualists who think they are two different things are flat out wrong. I have had people look me straight in the eye without even blinking and say that if a person's brain were destroyed, their mind would still function normally. Any book on the brain written in the 70s is going to be outdated. For example, Sagan wasn't sure if different parts of the brain affected different things. But an enjoyable read. In 1934, scientist Carl Sagan was born in Brooklyn, N.Y. After earning bachelor and master's degrees at Cornell, Sagan earned a double doctorate at the University of Chicago in 1960. He became professor of astronomy and space science and director of the Laboratory for Planetary Studies at Cornell University, and co-founder of the Planetary Society. 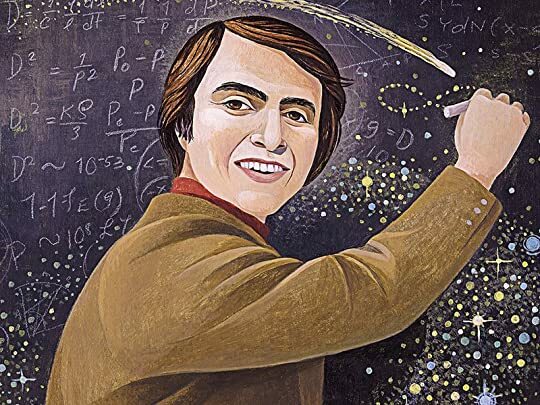 A great popularizer of science, Sagan produced th In 1934, scientist Carl Sagan was born in Brooklyn, N.Y. After earning bachelor and master's degrees at Cornell, Sagan earned a double doctorate at the University of Chicago in 1960. He became professor of astronomy and space science and director of the Laboratory for Planetary Studies at Cornell University, and co-founder of the Planetary Society. A great popularizer of science, Sagan produced the PBS series, "Cosmos," which was Emmy and Peabody award-winning, and was watched by 500 million people in 60 countries. A book of the same title came out in 1980, and was on The New York Times bestseller list for 7 weeks. Sagan was author, co-author or editor of 20 books, including The Dragons of Eden (1977), which won a Pulitzer, Pale Blue Dot (1995) and The Demon-Haunted World: Science As a Candle in the Dark (1996), his hardest-hitting on religion. With his wife, Ann Druyan, he was co-producer of the popular motion picture, "Contact," which featured a feminist, atheist protagonist played by Jodie Foster (1997). The film came out after Sagan's death, following a 2-year struggle with a bone marrow disease. Sagan played a leading role in NASA's Mariner, Viking, Voyager, and Galileo expeditions to other planets. Ann Druyan, in the epilogue to Sagan's last book, Billions and Billions: Thoughts on Life and Death at the Brink of the Millennium (published posthumously in 1997), gives a moving account of Carl's last days: "Contrary to the fantasies of the fundamentalists, there was no deathbed conversion, no last minute refuge taken in a comforting vision of a heaven or an afterlife. For Carl, what mattered most was what was true, not merely what would make us feel better. Even at this moment when anyone would be forgiven for turning away from the reality of our situation, Carl was unflinching. As we looked deeply into each other's eyes, it was with a shared conviction that our wondrous life together was ending forever."